The Difference Between a Partner and a Supplier: Q&A with Greg Newey, Vice President of Operations | Accu-Fab, Inc.
Q: What is the difference between the role of partner versus supplier? A: A partner provides products and services much like a supplier; however, a partner also provides significant additional value to the customer throughout the product life cycle. At Accu-Fab, we leverage our expertise with that of our customer to provide a complete, end-to-end solution. Q: What advantages does a manufacturer gain from choosing to work with partners over suppliers? A: Creating a partnership provides customers with a competitive advantage. The earlier a partnership is forged, the more value it brings. When we are involved at product conception, we can provide design and materials selection expertise for cost savings, manufacturability, and production efficiency. Understanding the design criteria and end use of a product provides the opportunity for continuous improvement, and provide our customers with a competitive edge. Q: Can you provide an example of efficiencies and/or cost savings a manufacturing customer was able to achieve as a result of Accu-Fab’s business partnership approach? A: We recently quoted fabricating an existing product for a new customer who was having difficulty with their current supplier. Upon award of the contract, our engineers reached out to our customer and worked together to modify the existing design which resulted in a simplified, more durable product, and significant cost savings. This is just one example where even a limited partnership adds significant value. Q: In your experience, does partnering enhance a manufacturer’s ability to introduce innovative new products? A: Yes, to be innovative and successful in today’s world requires a team with expertise in many disciplines. With tight budgets and staffing cuts, creating a partnership is the best way to achieve that goal. Q: Looking ahead to 2012 and beyond, how important is it that manufacturers enhance their supply chain with companies that hold to the philosophy of partnering? A: To thrive in the global economy, it is crucial that manufacturers embrace partnering. Selecting the right business partner will be instrumental in the success of the company. 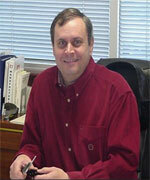 Greg Newey joined Accu-Fab’s management staff in December, 2006 as Vice President of Engineering. Greg recently accepted a new role as Vice President of Operations. His relocation from Atlanta has brought an additional 25 years of manufacturing knowledge to an already highly skilled engineering department. Greg has an extensive background in complex machined parts for the aerospace, automotive and medical industries. He spent 10 years on the Air Force F-22 fighter program, leading a design and fabrication team that developed the planes progressive assembly line, and much of the fighter’s production composite and metallic parts.